Raffles Place, Singapore – Vietnam Blockchain Week was organized by Infinity Blockchain Labs and took place on March 7-8th, 2018 in Ho Chi Minh City with over 2,500 participants from all over the world. The event provides a comprehensive outlook on the blockchain, from the status quo of policies, applications and the impact of blockchain on the industry. 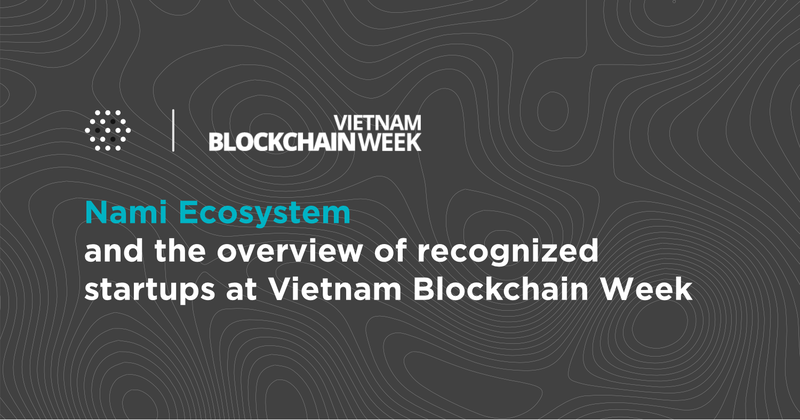 As an important partner of Vietnam Blockchain Week, Nami Corp. had the opportunity to introduce our blockchain-applied series to a large number of participants. Whether you are a regular user or just become aware of our brand, the article below provides you with Nami’s highlight activities throughout the event. Joining this event means that Nami can expand relations to many blockchain-based startups and businesses, meet “celebrities” in the blockchain industry, such as Charles Hoskinson – co-founder of Electronic Money, Ethereum and Cardano; Alex Medana – Council member of the Fintech Association in Hong Kong; Adam Vaziri, a member of the Board of Directors and Director of the Digital Currency Association of England; Loi Luu – Vietnamese 9X who successfully ran a fundraising of $52 million in crypto, currently rewarded in the list of Forbes “30 under 30”. Thousands of participants from Japan, South Korea, Singapore, the UK, the US, Australia, New Zealand, India, etc. showed their interest in the products which Nami introduced. Vietnam Blockchain Week is about the development of blockchain technology, the application of blockchain technology in finance and payment, the way blockchain technology is applied in government agencies, the impact of blockchain on e-commerce, venture investment, games, education, healthcare, IoT, etc. “Vietnam is at the forefront of the blockchain industry. This is a new field, and Vietnam is fortunate to own many of the best Blockchain engineers. That leads to our undeniable position with other Blockchain centers in the world. The only thing that we are losing compared to Singapore or Silicon Valley is a voice to let the world know that Vietnam is ready”- said Kimble Ngo – Marketing Director of Infinity Blockchain Labs. Nami’s ecosystem is proud to introduce nami.trade – a new revolution in the field of investment in the foreign exchange market, commodities, indices, bonds and cryptocurrencies. With the advantages of Blockchain technology, nami.trade opens a transparent, decentralized, anonymous, 100% automated trading platform that reduces transaction costs 100 times compared to traditional exchanges with the slogan “no spread, no swap, no commission”. The cost is only 1/10 for Spot trading and payout rate is up to 95% for Binary Option trading. Nami Assistant is one of the world’s first professional chatbot in finance. It received the grand prize of Facebook Hackathon in 2016. White paper for Contributors, officially published by Nami Corporation – Latest update on February 26th, 2018. The article has references to some reputable e-newspapers about Cryptocurrencies for the purpose of conveying accurate information. The information, knowledge, brand names, personal names, quotes, definitions and terms are not created or composed by Nami Corp. without authenticating with those from qualified sources. Nami Corp. does not take any legal responsibility for copyright-related issues of the referenced sites. There are only two Official Telegram Channels of Nami: nami.trade | International and nami.trade | VIETNAM. We don’t take responsibility for information in any other groups. Nami Corp. is a global FinTech Corporation working on Investment and Technology based on Blockchain. It’s not just a single platform, we have created the whole Ecosystem to help Contributors and Traders around the world to utilize their experience and their money with the slogan “no spread, no swap, no commission”.